The Cai Hong slot takes its inspiration from Chinese folklore and Caishen, the God of Wealth. You have to admit, it’s difficult to imagine a theme more appropriate for a slot game than a divine source of treasure. The action here takes place up in the clouds, where Caishen supposedly resides, and the reels are set against a sky backdrop, which changes colors as the game progresses, turning from bright blue to shades of pink and purple, indicating the upcoming sunset. 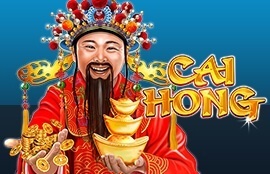 Cai Hong features 30 fixed paylines and 5 reels, plus a non-progressive jackpot cash prize of 50,000x your stake, on a single spin. Caishen's name is often invoked during the Chinese New Year celebrations, and many of the other symbols used in Cai Hong, like the rabbit, the ox, the pig, the dog, the rooster, and the tiger, are animals, which are also prevalent in Chinese folklore and mythology. Meanwhile, an icon of Caishen acts as the Wild, and can substitute for all of the other symbols, except the rainbow Scatters. In Chinese Cai Hong means Rainbow, and this colorful arch proves quite important in this game. You'll need to land at least 3 such symbols in order to launch the bonus round where you will receive 8 Free Spins with all your wins doubled. This might not seem like a whole lot but on top of that, you'll also be offered Bonus Picks allowing you to win additional spins and higher multipliers. Triggering the bonus feature with 3 rainbow symbols will get you 2 picks, 4 Scatters will allow you 3 picks, while 5 rainbows will get you 4 opportunities to pick. The maximum amount of Free Spins to be won here is 33 and you can reach a multiplier as high as 15x, however, the feature can also be retriggered by landing another winning combination. In such a case you will be awarded 15 more Free Spins in addition to the ones, which you've already claimed, seriously raising your opportunities of winning big! This slot is available on Instant Play, Download and a Mobile version. This way you have a chance to score divine wins from wherever you are most comfortable; whether it’s from home, during your commute to work, or even while you’re out at the beach... Check out this fun, Oriental-themed online slot at Jackpot Capital online casino today!